KVS PGT Geography Exam Guide: Hello Aspirants, as we all know that the Kendriya Vidyalaya Sangathan is going to conduct written test for 8339 posts of Teaching Staff. Candidates who have recently applied for the post of KVS PGT, now they are started looking for Best and appropriate Books for PGT Geography Exam. 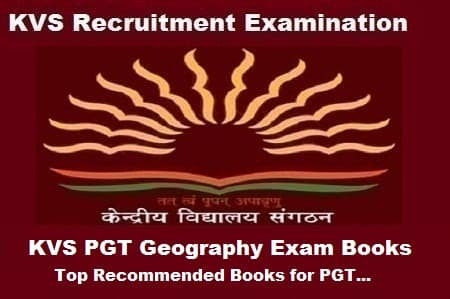 there are many KVS PGT Geography Books which are available for the same subject, now choosing an appropriate book according to the KVS Recruitment examination pattern is a very Crucial problem for all the aspirants. so in this article, we will provide you with the detail information about the KVS PGT Geography exam Preparation Books. On the Basis of the written test, candidates will be eligible to qualify for the Interview, hence making the written exam Very Important. Plan your study schedule with these highly recommended books for KVS Recruitments Examination for sure success in the written exam. Before we discuss best available books to crack KVS Recruitments Examination 2018, let us read the complete syllabus for this prestigious exam. (d) Evaluation: Types, tools, characteristics of a good test, continuous and comprehensive evaluation, analysis and interpretation of scholastic achievement test. Note: The Final Merit List will be based on the Performance of the candidates in written Test, Performance Test, and interview. The weightage of written Test, Performance Test and interview will be 85:15. Topic- 1: Geography as a discipline- Geographical ideas in ancient, medieval & modern periods: the contributions of Varenius, Kant, Reine, Humboldt and Ritter. Influence of Richthofen and Darwin. Videl-da-la Blache, F. Ratzel etc. Motions of Earth: Rotation, Revolution, Occurrence of Day and Night; change of seasons; Latitudes and Longitudes; Finding time. Earth’s Interior: Origin of contents and ocean basis Wagener’s Continental drift theory, Theory of Plate Tectonics Earthquakes and Volcanoes, Folding and faulting Origin of the Earth: Nebular hypothesis (old Theory) and Big-Bang Theory. Evolution of continents, atmosphere and oceans. Topic-3: Interior of the Earth and Distribution of oceans and continents- Constitution of Earth’s interior (based on Seismic Evidence), the origin of the continents and ocean basins. Wegner’s theory of Continental drift and Plate Tectonics. Plate movements and interactions-Volcanism and seismicity. Mineral and rocks- classification of rocks, rock cycle. The important minerals geomorphic process of denudation Endogenic and Exogenic processes. Mass Wasting, Landslide, Work of River, Glacier Wind, Sea Waves etc, processes of soil formation. Topic-6: Water (Ocean) Geomorphology of the ocean floor, submarine relief features of Atlantic, Pacific and Indian Ocean. Movement of ocean water: Currents, tides and waves. Marine deposits and coral reefs. Man and the Biosphere: Interactive and dynamic relationship. Human impact on biogeochemical cycles. Topic-8: India: the Geographical basis of Indian State-territory; location, extent, shape and size. Topic-9 Physiography: Structure, Physiographic divisions, Drainage system and its evolution. Topic-10 Climate, Vegetation and Soil Climate: factors controlling the climate of India Origin and mechanism of Indian monsoon; Seasons of India, Classification of the climate of India (Koeppen’s, Thornthwaite, Trewartha). Soils: Type and distribution (I.C.A.R. ), Soil problems, conservation of soil Vegetation- Types & Distribution; conservation. Topic-11: Natural Hazards and disasters- Causes, Consequences and management in India Environmental Hazards: Floods, droughts, cyclones, earthquakes and landslides; human adjustment to hazards; hazards perception and mitigation; environmental institutions and legislation in India. Topic-12: Human Geography: Nature and Scope. Nature and scope of Human Geography, Approaches to the Human Geography, Determinism, Environmental Determinism, Possibilism, Neo-determinism, ecological and Behaviouralism. Topic -13: People (World and India) Trends and patterns of population growth: determinants and patterns of population distribution; theories, demographic transition; Human migration, Patterns of human development. Transport and communication Roads, railways, waterways and airways; oil and gas pipelines, national electric grids. Unstable and stable settlements, rural settlements: origin, types and patterns; Urban settlements: Origin and growth of towns; functional classification of towns. Problems of urbanization in the world; urbanization in India; Urban slums and squatters. Environmental pollution-Land, Water, Air, Noise, Global Warming, Poverty, Food Security; Sustainable Development. The Exam for KVS Recruitment 2018 can be broadly categorized into various subjects. Let us discuss one by one. This book is highly recommended for candidates preparing for the CTET and KVS exam. Read every page of this book as many times as you can. Work hard and Smart. Here in this section, we have mentioned some best and appropriate PGT Current affairs books for KVS Recruitment Examination. Here in this section, we have mentioned some best and appropriate Reasoning Ability books for KVS Recruitment Examination. This book is recommended for candidates preparing for the CTET and KVS exam. Read every page of this book as many times as you can. Work hard and Smart. All the very best. Child Development and Pedagogy is the most important subject for CTET and KVS exam. We have listed the books name below. You can take the reference of these books to score great in Teacher Eligibility Test. Here in this section, we have mentioned some best and appropriate Quantitative Aptitude books for KVS Recruitment Examination. We have tried to compile all the latest and valuable information required to score great in the Prestigious KVS Recruitment 2018 Examination.